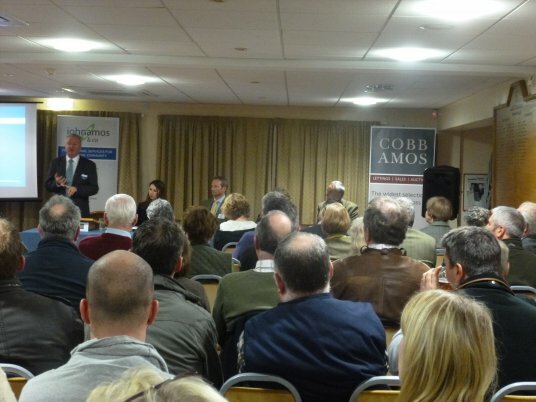 John Amos & Co were hosts for a very informative Farming Update meeting at The Luctonians Sports Club on Wednesday 22nd January 2014. The meeting was Chaired by Paul Cobb from Charles Mayson Limited and four speakers gave presentations. John Amos spoke mainly in relation to the Single Payment Scheme and it’s conversion to the Basic Payment Scheme for 2015 and gave Farmers a thorough presentation on important issues which will lead to changes in farming practice, particularly in relation to greening for crop diversification, ecological focus areas and dealing with permanent pasture and grassland. Emphasis was placed on the fact that although a lot of measures have been agreed in principle, these are still to be confirmed and the “devil is in the detail”. Farmers were urged to start preparing for 2015 now, but to be aware that until the rules are finalized, this could still be subject to change. Joanna Cobb from Cobb Amos then gave a presentation on the property market in the region, both in relation to property sales and also lettings and gave a thorough insight into the movement in the property market over the last 10 years. Caroline Hanks from Campaign For the Farmed Environment gave a presentation on environmental farming practices and how important it will be to link ecological focus areas with good management in the future and the benefits that this can offer and also the importance of dealing with run-off into the rivers and how to manage farms to protect our water courses. Finally, Charles Mayson from Cross Compliance Solutions reiterated the importance of cross compliance, both now and in the future and the dangers to farmers who are being complacent by keeping their records in order and the penalties imposed if these are found to be frail. The meeting was attended by over 100 Farmers and as a result of feedback on the night, requesting more meetings and information, a further meeting is planned in February for those who were unable to attend this update and interested parties should contact John Amos by email john@johnamos.co.uk or telephone the office on 01568 610007 to be kept aware of the date of this next meeting. Any farmer or landowner concerned about the changes in 2015 for the Basic Payment Scheme should contact John Amos or Bob Bowen on 01568 610007 to discuss.